Cardamom oil is colourless to pale yellow liquid having sweet, balsamic and characteristic spicy odour. Cardamom oil is extracted by the process of steam distillation of the seeds of green cardamom. Cardamom is a perennial herb cultivated in southern India. It is commonly used for flavouring foods, sweets in India for centuries. Cardamom oil is normally used for fragrance and flavours apart from its several therapeutic uses. Cardamom oil contains are Alpha Pinene, Beta Pinene, Sabinene, Myrcene, Alpha Phellandrene, Limonene, Cineole, Para Cymene, Terpinolene, linalool, linalyl acetate, terpinen-4-oil, Alpha Terpineol, Alpha terpineol acetate, citronellol, Nerol, Geraniol and Methyl eugenol. Cardamom, known as the grain of heaven is one of the natures’s healing gifts. Being the most renowned Cardamom Pods Manufacturers, our superior quality Cardamom Products are valued for their strong and peculiar taste and intense aroma. Nurtured under the expert guidance of our team, we ensure that our Cardamoms are free from fertilizers and guarantee perfect taste. Our Cardamom Products include Cardamom Pods, Cardamom Powder, Cardamom Seed Oil and Cardamom Oil. Apart from being pure and natural; all our products are healthy and nutritious. Known to lend an exotic flavor, our Green Cardamoms are big in size and light green in color. Thus, they are used to prepare many food items and delicacies. Counted among the most reckoned Cardamom Seed Products Suppliers, we deliver our cardamoms in tightly packed pouches so as to restore their original aroma as well as their original astringent taste. A perennial, reed-like herb, Cardamom grows wild and is cultivated in India and Ceylon. It grows up to 4 meters (13 feet) high and has long, green silky blades, small yellowy flowers with a violet tip and a large fleshy rhizome, similar to ginger. Oblong gray fruits follow the flowers, each containing many seeds. Cardamom was well known in ancient times and the Egyptians used it in perfumes and incense and chewed it to whiten their teeth, while the Romans used it for their stomachs when they over-indulged. The Arabs ground it to use their coffee and It is an important ingredient in Asian cooking. Valerius Cordus first distilled the essential oil in 1544 after the Portuguese discovered the East. 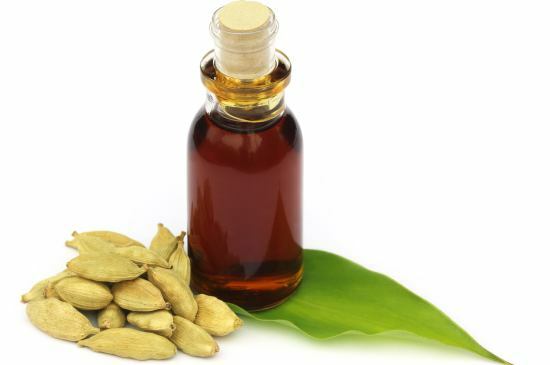 Buy Cardamom Oil, oil of elettaria cardamomum online www.cardamomoil.in. Our Cardamom Oil (oil of elettaria cardamomum) is aromatherapy quality, additive free, first distillation, undiluted, therapeutic Cardamom Essential Oil. When you buy our Cardamom Oil, you are buying pure, additive free essential oil We do not dilute our Cardamom Oil with carrier oils, we only provide the purest therapeutic Cardamom essential oil available. Furthermore, our Cardamom Oil is 1st distillation, which means our Cardamom Oil has the highest therapeutic value available. Our Cardamom Oil, (pesticide free) and additive free. Read more about our pure Cardamom Oil below. It has a sweet, spicy, herbal, fresh aroma which can be described as green. Therapeutic grade Cardamom essential oil (oil of elettaria cardamomum) is best used as a digestive aid,a natural remedy for upset stomach. Cardamom oil is well known for constipation relief, and reduces water retention, relieves stomach cramps and flatulence. Cardamom oil works wonders for women with IBS, chronic constipation and bloating (water retention). Cardamom essential oil is also well known as a natural remedy for sinus headaches, mental fatigue, catarrh & physical exhaustion. Cardamom oil is well known as a digestive stimulant and can be used in abdominal massage preparations to sooth symptoms of IBS and indigestion - blend with carrier oil or massage oils. Cardamom Oil is also helpful with calming muscle spasms which, when blended with Roman Chamomile, can help with colitis - simply blend with massage oil or lotion and apply in circular motion to the abdomin. To invigorate the body as well as the spirit, place a 10 drops of Cardamom oil into a hot bath. To remedy headaches and mental fatigue, blend cardomom oil with a carrier oil or unscented lotion and rub on temples and neck. Cardamom is an antiseptic, digestive stimulent, calmative, stomachic, diuretic, andtispasmodic and expectorant. Our Cardamom Oil is most commonly referred to as: green cardamom oil, or true cardamom oil, cardamom essential oil, and oil of elettaria cardamomum. While we make every effort to ensure accuracy of the Cardamom oil data provided online, all information in reference to Cardamom essential oil is provided for educational and entertainment purposes and is not guaranteed to be 100% correct or complete. Information regarding our Cardamom essential oil is not is not intended to assess, diagnose, or prescribe for any medical condition. Always seek proper medical advice prior to beginning any treatment with Cardamom oil or any other essential oil.